Why visit St Kitts and Nevis? 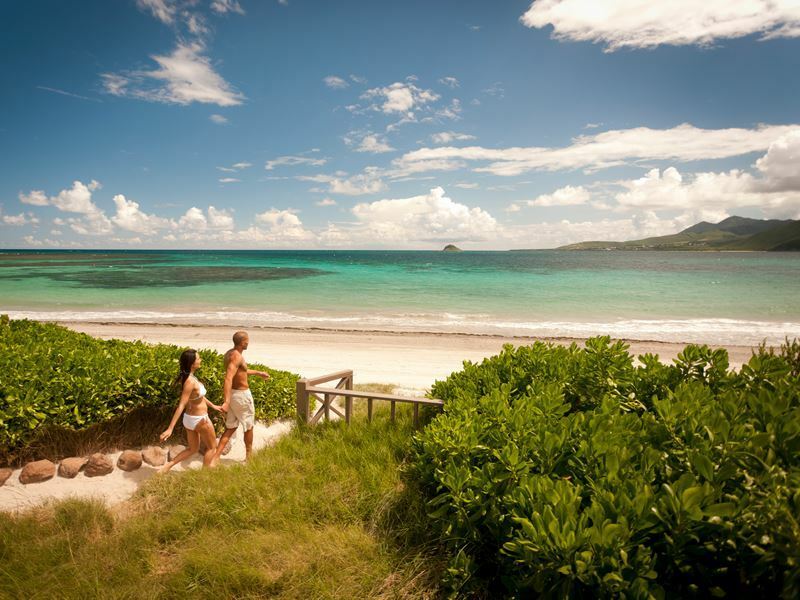 The picturesque stretches of soft white sands on St. Kitts call to visitors, as if asking them to throw off those shoes and allow nature to take all cares away, but you might want to leave those shoes on just a little bit longer, as this lush island once known as Liamuiga, or the “fertile isle,” offers lots to explore. 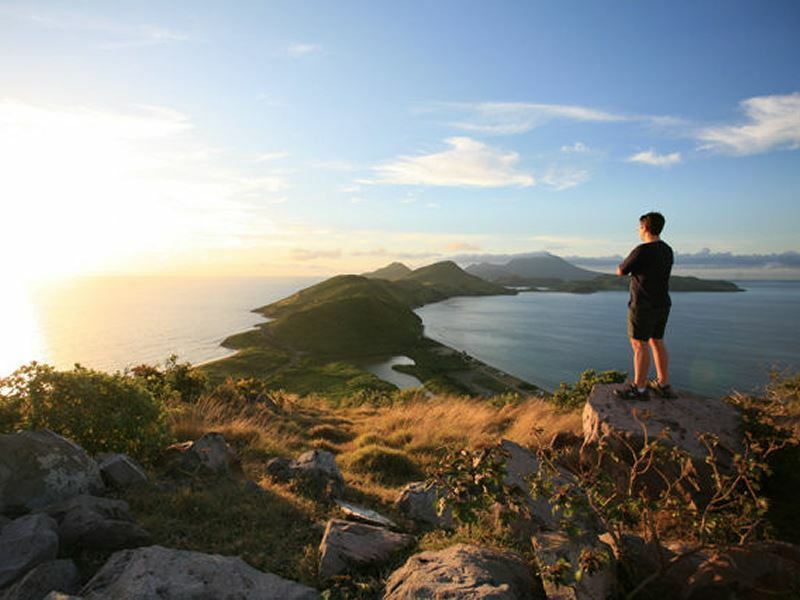 St. Kitts is home to mountain ranges that stretch into the sky for nearly 4,000 feet, while the interior contains virgin rainforests that are alive with hummingbirds and wild green vervet monkeys. If you’re arriving via cruise ship, you can simply walk through the port and into downtown Basseterre to browse the offerings in the island’s capital city, and much of the rest of the island is walkable too. Temporary driver’s licences and car rental agencies are available, and taxis are plentiful too. In fact, buses and taxis actually outnumber those who need them. Private buses are actually minivans, decked out with unusual names like “Street Freak” and “De Punisher.” These can be booked and will take guests to their required destination, while the public buses follow a specific route around the island. There’s a stop right at the ferry pier, and in Basseterre, most leave from the bus stop on Bay Road once passengers have filled them up. Getting around on your own two feet, however, will allow you to experience parts of the island that can’t be seen from behind the wheel or the window of a bus. One of St. Kitts' biggest draws, other than its beautiful sandy beaches, is its rainforest. It covers nearly a quarter of the island, stretching from the foothills of the dramatic mountainous interior all the way to the coast. There are miles of miles of trails that wind through the landscape, whether you want to enjoy a short trek on your own, or a longer, guided hike. Hiring a guide is a good idea for safety reasons, but it also offers the chance to take advantage of the wealth of knowledge the experts have at hand. They can help you spot those playful monkeys that are often camouflaged, as well as lizards, mongoose and colourful birds, while educating you about plants that can cure disease and even which trees can bring you good luck. Don’t forget your camera and an extra memory card – with so many possibilities for picture-perfect shots, you’re likely to need it. 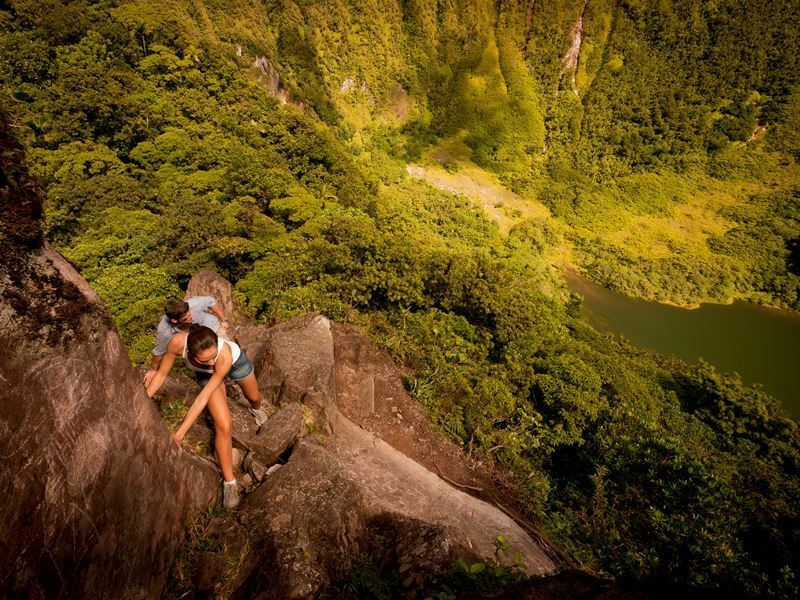 As you visit various areas of the island, you’ll have the opportunity to view different aspects of majestic Mount Liamuiga, the highest point in the Lesser Antilles chain at almost 3,800 feet. Located in the island’s northern region about 14 miles from Basseterre, to get a close up look, visitors can take a steep hike to the volcano’s crater. Don’t try this without a guide as access to the rim, as well as the inside of the crater is considered to be difficult, and sometimes even quite treacherous. It requires at least a basic level of physical fitness, and a two-and-a-half to three-hour trek to reach the rim. If you’re up for the adventure, your effort will be rewarded with jaw-dropping views of the neighbouring islands, the endless glistening waters of the Caribbean, and the sight of the remarkable crater. Plus, you may see monkeys and other creatures as well as wild orchids along your journey. The more daring can descend right down into the crater for a once-in-a-lifetime experience, and the unique feeling of being totally enveloped by the mountain. Be sure to bring sturdy hiking boots as the trail is rough and can be muddy. There isn’t much of an actual path, which means you’ll be doing a lot of grasping onto roots and trees to haul yourself up in some areas. One of the most well-known attractions on the island is Brimstone Hill Fortress National Park, a UNESCO World Heritage Site that was built between 1690 and 1794, widely believed to be one of the finest examples of British military architecture in the world, as well as one of the best preserved forts in the Americas. Located just south of the town of Sandy Point, this “Gibraltar of the West Indies” offers the chance to walk in the footsteps of the African slaves who built and maintained it. If you climb to its top slopes on a clear day, you can take in vistas of the forested mountains, cultivated fields, the practically endless blue shades of the Caribbean, and as many as six other islands in the distance. Take a self-guided tour of the fort’s interior and grounds to view evidence of the former military community and learn about its history. The highlights include Fort George Citadel, one of the oldest and most well-preserved examples of British Polygonal Fortification that still survives anywhere in the world. It hosts the Fort George Museum which provides insight to the history of the site. Completed in the late 18th century, the Prince of Wales Bastion was constructed as a defence against enemies, and is one of the most well-preserved areas of the park in addition to offering more spectacular views, while the Artillery Officers Quarters and Cookhouse was once home to the officer in charge of artillery and his second in command. Although much of it is in ruins, it’s still magnificent to see, with its massive arches set upon the ground floor. St. Kitts’ quaint capital city sits along the southwestern coast, and as mentioned, is easy to access on foot right from the ferry dock. Renowned for both its friendly locals and a thriving art scene, you’ll want to make some time for visiting the art galleries, boutiques and craft shops, some of which boast gorgeous watercolours and other works by Caribbean artists as well as locally made items like dolls dressed in the brilliant shades of the island, jewellery, leather wallets, purses and flip-flops. Mingling at “The Circus,” a focal point for locals and travellers surrounding the main square, is a must. At its centre is a green clock and a late 19th century water fountain. This is your chance to get to know a more authentic side of the island, experiencing the colourful nature of the locals and vendors who sell everything from fresh fruit to unique souvenirs, and checking out some of the finest examples of Georgian architecture in the Caribbean. 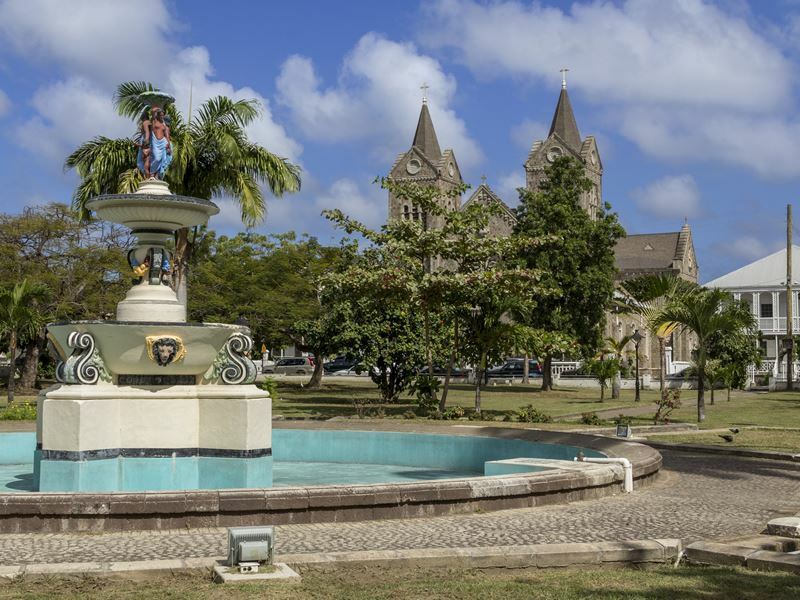 From this central point, you can take a short stroll east down Bank Street to Independence Square, the former site of a slave market that was renamed when the country gained independence from Britain in 1983. On a Saturday morning, be sure to head to the Market in Basseterre to do some people watching, and to buy fresh, locally grown fruits and vegetables in season. 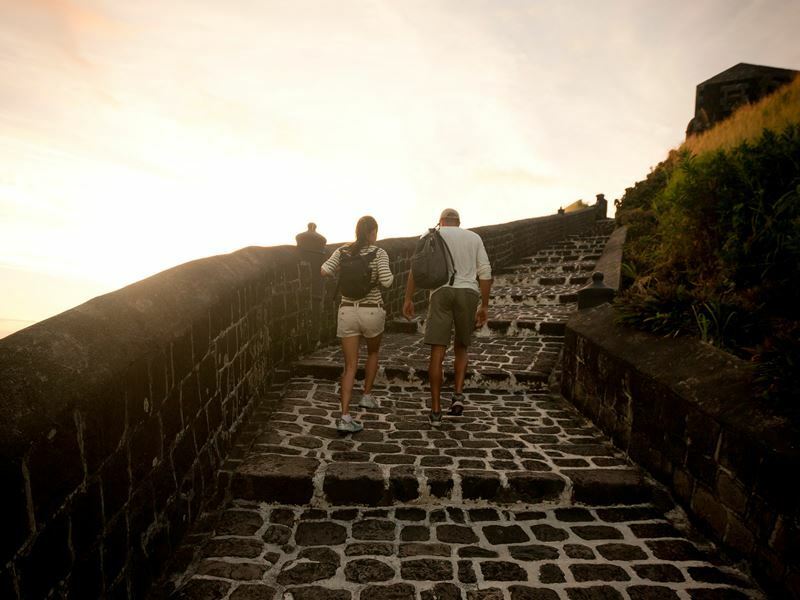 Exploring St. Kitts on foot is truly the best way to discover everything it has to offer. And, remember, after all of that walking, you can look forward to dipping those toes in the soft sand and soothing them in the warmth of the tranquil Caribbean waters.